Why is there so much fuss about giving an experience instead of an object? 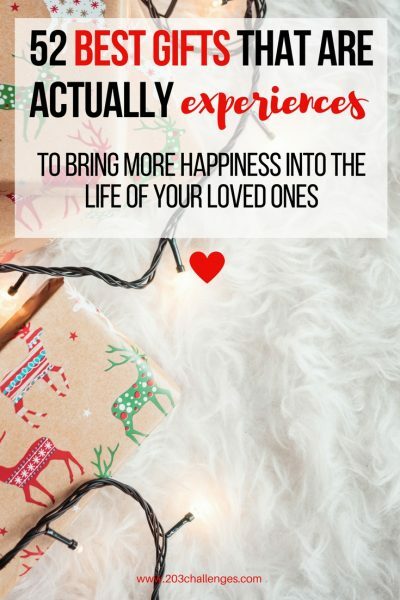 If you need an idea for a really, really special and unforgettable gift for a loved one, choose an experience instead of just more stuff. Why? It has already been proven many times that experiences make us happier than objects, and that this happiness lasts longer. 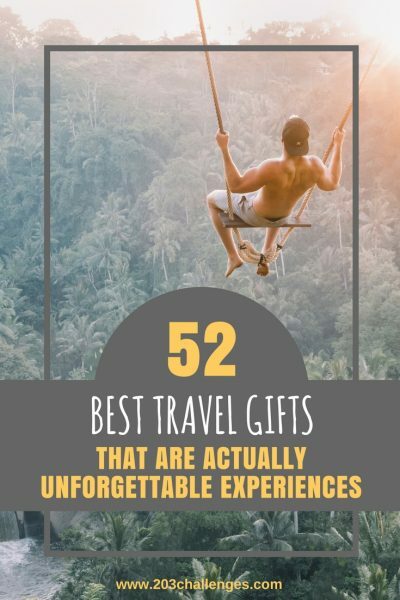 To help you become everyone’s favorite gift-giver, read our list of 52 experience gift ideas, so you have at least one for every week next year. How thoughtful of us (and you)! 1. Opera/theater/show tickets (for the best seats, of course). 3. Plane tickets. Not really creative, but plane tickets are always a good idea. 4. A day at a spa center. Or, even better, at a warm outdoor swimming pool when it’s winter outside. Raise the stakes by bringing a flask of hot tea and rum. 5. A massage, preferably accompanied by a glass of wine or a cup of hot chocolate. 7. 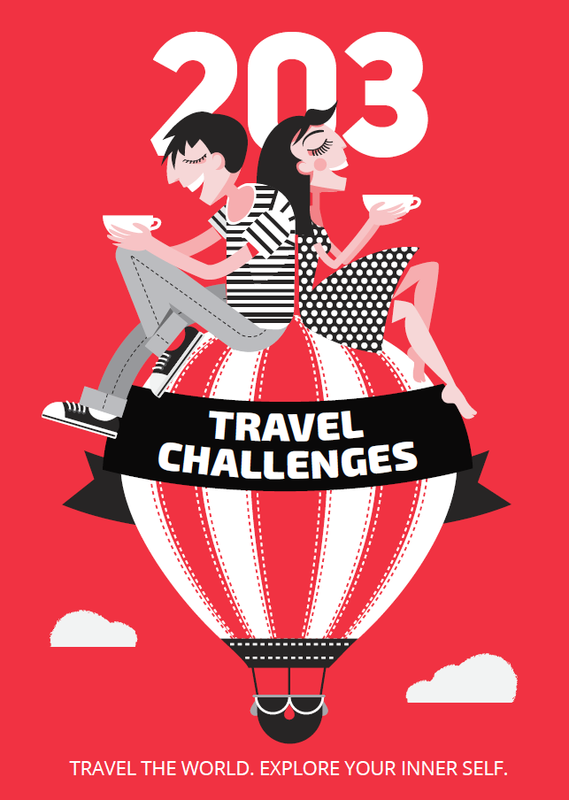 A book full of travel challenges. 8. Wine tasting. Beer tasting. Whisky tasting. Chocolate tasting. 10. A surprise trip (read How to plan the perfect surprise trip). 12. Paragliding – a tandem flight. 13. A paragliding course (a whole new level where you can fly without an instructor). 15. A day at a board games club. 16. A visit to an escape room. 17. A visit to a soundproof (anechoing) room – this is a hard task as there are just few anechoing chambers (absorbing every single sound and providing 99.9% silence) in the world, and they usually open only on specific days. They say that if you stay in an anechoing chamber for a while, you will start to actually hear your heartbeat. 18. A ‘coupon’ promising the recipient one day of your life together to do whatever they like. 19. Stargazing with a cup of hot chocolate. 20. A night at a Bedouin camp (for this particular idea you will need to already be in a country with Bedouins). If you are there anyway, use the chance to organize a great surprise by booking the night secretly, kidnapping your friend and taking them to the desert. 21. Glamping. Or champing (camping in a church) if you feel like scandalizing the religious society. 22. A dinner at a restaurant with such exotic cuisine that you can’t pronounce any item on the menu and you have to helplessly point to dishes to order them. 23. A whole day at a theme park. 25. A day on a yacht/boat with lots of champagne and a playlist with your favorite music. 26. A day snowshoeing in the mountains. 27. A cocktail night at a rooftop bar. 29. A visit to a haunted/abandoned house. 30. A language course. Or step up your game by arranging a language course that takes place abroad. 31. A professional photo shoot. 32. If the person’s birthday occurs during a cold month, take them to a beach destination for a change. Or take them to a snow-capped mountain if they have never seen snow. 33. A party train ride. Book a whole compartment for the two of you, or for a bunch of friends. Bring goodies and drinks for everyone and let the party begin. 34. A hike in the mountain. Hide a box with a tiny cake and a bottle of champagne in your backpack. When you reach the peak, pop open the champagne and light the candles on top of the cake (you will probably have to buy non-extinguishable candles, because mountain peaks are windy places). 35. A night in a floating bungalow. 36. A dinner themed around the country of your most recent trip together. 37. Reunite the birthday person with an old friend who has been living abroad/faraway for years. Secretly arrange the friend’s arrival and, under the guise of a casual coffee with you, make the surprise meeting happen. 38. A membership for a museum, aquarium or a science center that lines up with the person’s interests. 39. A personal horoscope (if the person is into astrology). Substitute with a personal guided meditation, a human design, a personal coaching session or anything that will suit your friend’s soul. 41. Horse riding at sunset along the beach. 42. A subscription to yoga classes or any other sporty activity that will keep them healthy. 43. Anything homemade, because a homemade cake or herb-infused vodka is much greater than the product itself; it shows that you put time, effort and intent into creating it. 44. A luxury first night for a budget traveler. If you have a friend who spends most of their life on the road in crappy hostels and low-grade shared rooms, you can give them a ‘voucher’ for a first night in a luxury hotel for their next trip. After 26 hours of flying and interrupted dozes in airports, they will be more than thankful for a fluffy, cloud-like pillow and a real mattress in a soundproof hotel room. 45. Premium membership for their favorite app or online subscription. This could be Spotify, Calm or whatever service they love but would never splurge on. 46. Make one of their dreams come true. Has your friend always wanted to publish a book? To record their own song? Help them make their hobby a little bit more tangible by paying for the record or the publishing service. 47. Laughter. Have any of your friends been under the weather recently? 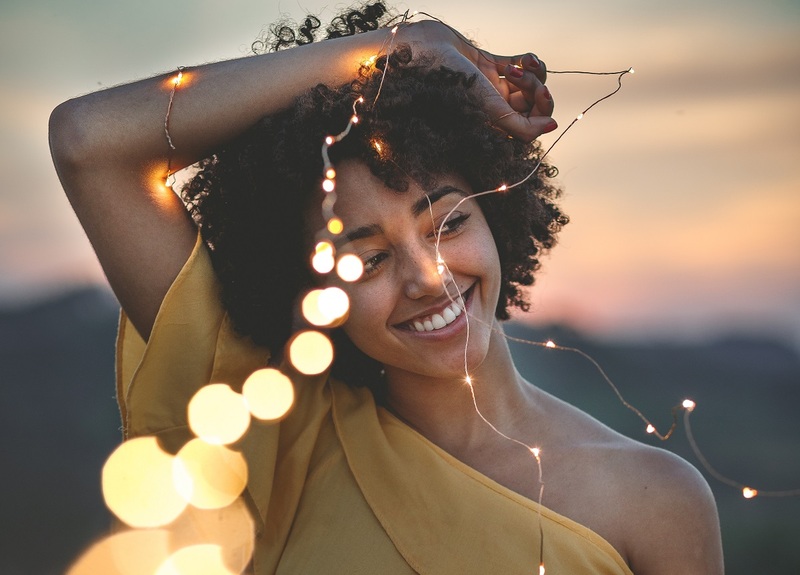 Think of a way to make them laugh a bit: buy them tickets for a stand-up comedy show, take them to a comedy movie, or just organize a meetup with a mutual friend who is known to be light-hearted and always full of creative jokes. 48. A list of 52 challenges to complete during the next year. Make them fun and creative, and remember that some of them should be goofy and silly because that’s what friends are for! Thus, your gift won’t be forgotten for an entire year (and probably much longer). Browse through our Inspiration section to get some ideas. 49. A fixed sum of money with a catch. A 100-dollar note with a different kind of note, like: “On May 17, wherever you are, you have to spend this money on something unconventional, something you wouldn’t normally do. Spoil yourself, get adventurous or do whatever you feel like in the moment”. 50. A surprise party. OK, this is a classic. But if you haven’t done it yet, it’s almost always a cool idea. 51. A test drive of a fancy sports car. 52. A short video you secretly shot for this special person during your travels. Use a basic free video editor to make it shine a bit, then give it to the person on a memory stick wrapped in a ribbon.